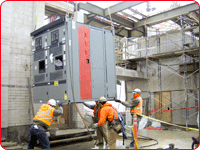 Ewing Electric, Inc. is one of the oldest and most diversified electrical contractors in the state of Washington. Family owned and operated since 1945, Ewing Electric, Inc. is currently combining the experience and expertise of the second generation with the new ideas and fresh approach of the third generation. We specialize in academic, medical, industrial, commercial, and design-build projects throughout Western Washington, and our strong financial statement allows for a large bonding capacity. We value good people and are proud to claim our office and field staff has an average of 18 years with the company. Ewing Electric, throughout its existence, has been affiliated with the International Brotherhood of Electrical Workers. Our management has worked closely with the Union on both a local and national level with the goal of providing efficient, quality production for our clientele. We have found it refreshing in the current climate of misrepresentation to deal with a firm such as Ewing.